CDAC Academic Partner Jung-fu "Afu" Lin has been approved for tenure and promoted to the rank of Associate Professor in the Jackson School of Geosciences at the University of Texas at Austin. Professor Lin has been a CDAC partner since 2009. He was a postdoctoral fellow at the Geophysical Laboratory and then a CDAC Research Scientist at the beginning of the Center in 2003. He was then awarded an E. O. Lawrence Postdoctoral Fellowship at Lawrence Livermore National Laboratory and worked there for two years prior to his appointment at UT Austin. 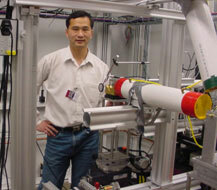 Professor Lin's work focuses on the application of synchrotron techniques to geophysical and materials science problems at extreme conditions, such as the nature of the Earth's core, spin transitions in iron-bearing minerals and thermodynamics of materials.